Reno”s Mallory McGwire averaged 21.8 points, 14.3 rebounds and 6.9 blocked shots per game, and collected her second straight Review-Journal state player of the year award. 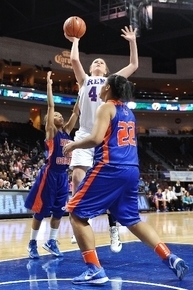 Reno's Mallory McGwire shown shooting against Bishop Gorman, is the Review-Journal's girls state Player of the Year. 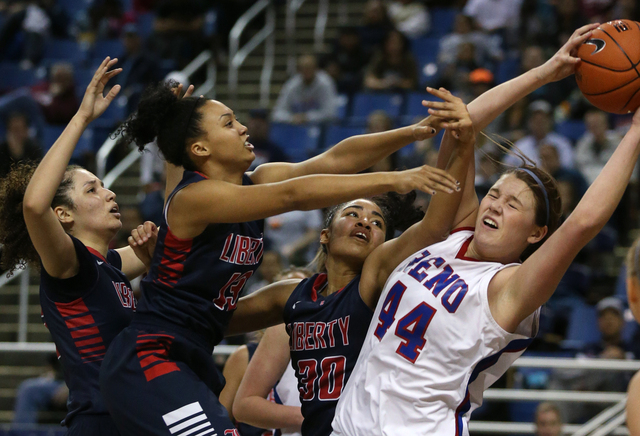 At 6 feet, 4 inches tall, it’s difficult for Reno High junior Mallory McGwire to blend in. But after her sister, a 6-2 post, graduated last year, and three of the Huskies’ other top players also headed off to college, McGwire became the center of every opponent’s attention. Finding the girl who seemingly was a head taller than everyone else on the floor was easy. Stopping her, not so much. McGwire averaged 21.8 points, 14.3 rebounds and 6.9 blocked shots per game, and collected her second straight Review-Journal state player of the year award. “At the beginning of the season, it was a little different for her. 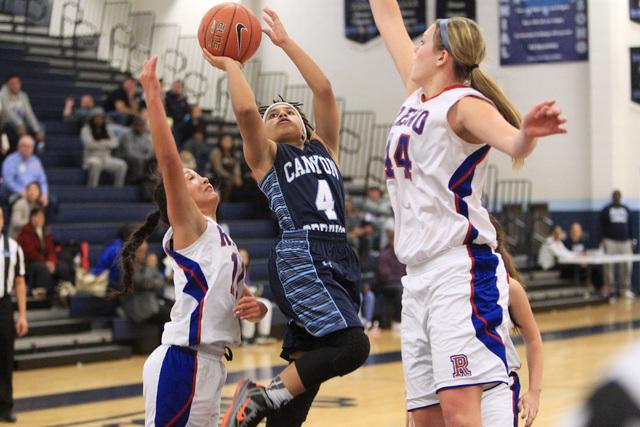 We had never asked her to take on that big of a load,” said Reno coach Shane Foster. “She faced a lot of double teams, but if you don’t double her, she’s getting 30 points by the middle of the third quarter. As a sophomore, McGwire averaged 15.5 points, 11.7 rebounds and 3.9 blocks per game, but she had plenty of help from her sister Morgan (12.2 ppg, 10.6 rpg) and outside shooters Shalen Shaw, Savannah Schulze and Alyson Rippingham to take pressure away. “Whether it was her sister or Shalen on the perimeter, to double one of our players last year, you had to leave someone pretty good open,” Foster said. With all four teammates gone, it was clear who opponents wanted to stop. But McGwire handled it well, improving her passing skills and helping guards Daranda Hinkey (10.6 ppg) and Mikayla Shults (8.6 ppg) develop. McGwire also was asked to play more minutes this year, and often had to play through foul trouble as she helped the Huskies (24-4) to the Division I Northern Region title game. “She maintained her composure unbelievably well,” Foster said. “There were times when it looked to people like she had to be fouling someone, but she was just standing there. She’s just so long and athletic. Her footwork will keep getting better because she works on it. McGwire, who is drawing interest from Pac-12 and Big 12 colleges among other big-name schools, and former Reed guard Gabby Williams have won the state player of the year award twice each in the last four years. Williams is a freshman at Connecticut.